The period covered by Arts:Search is 1913. Available soon. Short-lived Modernist magazine – only three issues published, May, June, July 1913. Edited by John Middleton Murry; with Katherine Mansfield as associate editor. It was a successor to Rhythm (1911-1913), of which Murry and Mansfield were also editors. 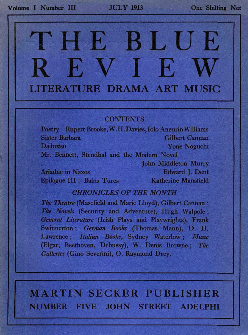 Murry conceived The Blue Review as “the Yellow Book of the Modern Movement”, although in truth it doesn’t really stand up to comparison with its Fin de siècle predecessor, or Rhythm for that matter. Includes writings by Mansfield, D.H. Lawrence, Max Beerbohm, Walter de la Mare, James Elroy Flecker, W.H. Davies and Rupert Brooke. Artists whose work is illustrated include X. Marcel Boulstein, Stanley Spencer, G.S. Lightfoot, J.D. Innes, Frances Jennings, Max Berbohm, Ambrose McEvoy, Derwent Lees, Norman Wilkinson, and Harold Squire.